Mrs. Obama left the ten-day Asia tour today to head back to the United States. Could it be that the first lady is afraid of making another controversial fashion choice, like her head scarf worn yesterday? I think this is probably played a factor in her early departure. On her way back to the White House, she stopped in Ramstein-Miesenbach, Germany to speak to military personnel, as well as their families, at Ramstein Air Force Base. 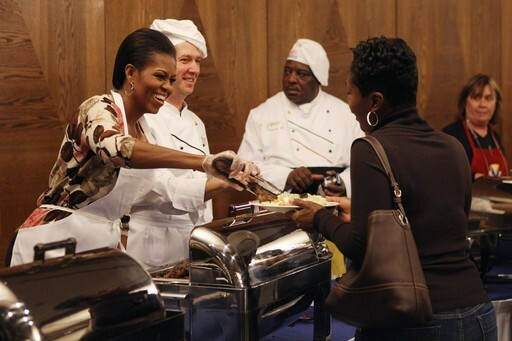 The first lady not only thanked these military troops in speech, but also by serving them a warm lunch. For this occasion, Michelle Obama was dressed much more casually than she has been seen the past few days in Asia. She wore black slacks paired with an eggshell white tank top and floral cardigan. Her look is very laidback, yet perfect for this service opportunity. She shows that a woman can still look absolutely stylish while serving others. To view a special Veteran’s Day announcement from First Lady Michelle Obama and Dr. Jill Biden, please watch the video below. What are you doing to say thank you this Veterans Day? Maybe Not So Dashing in Donna? First Lady Michelle Obama and Jill Biden both appeared at a fundraiser for the Democratic National Committee in New York City this evening. Before the event, Mrs. Obama attended a dinner hosted by designer Donna Karan, which might explain Michelle’s outfit of choice. For this event Michelle Obama chose to wear a Donna Karan draped halter dress (see here) in a rich, charcoal color. Her hair was pinned up in a chic, pompadour bun, and she completed her look with a chunky necklace designed by Erickson Beamon (also the designer of many of Michelle’s chunky, statement belts). Dr. Biden also looks quite fashionable, wearing figure-flattering dress with cow neckline and accented with a brooch. Perhaps she has upped her look in order to compete with the iconic style of Michelle? We all know Michelle was the first to add the brooch to a simple frock. I absolutely love this look on Jill Biden; she looks fabulous. I am also a fan of this teased bun on Michelle. However, no offense to Donna Karan, but this dress looks hideous on the first lady. I think this is one of those dresses that only look good on rail-thin models of the runway. It gathers in too many places on Michelle’s silhouette, making her appear larger than she actually is. 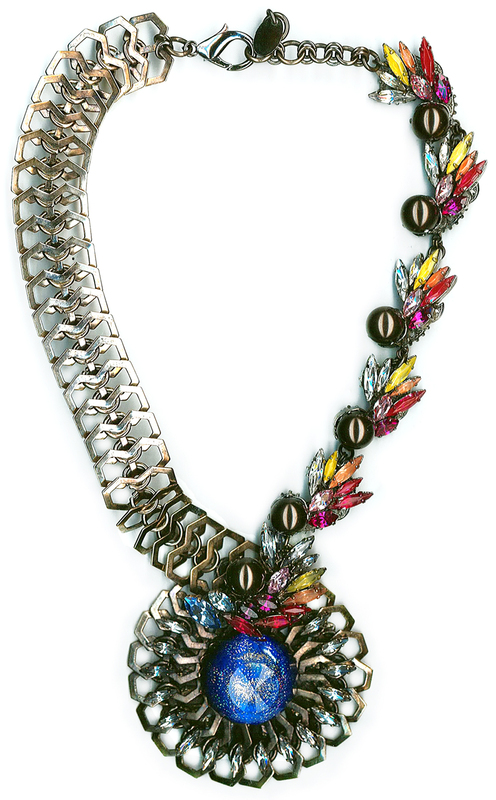 On the other hand, I have always been a fan of the talented Erickson Beamon, and he has yet to let me down! I adore this overstated necklace, and love that Michelle wore her hair up to show it off. How do you think these two women of D.C. look?